If you regularly use Windows Explorer, it is advantageous to be able to start any application from the Explorer Window. Most users are familiar with how to add folders to Windows Explorer, but when you try to drag an application to the list, an error message is displayed stating that the application cannot be added. There is a simple method to remove this limitation. Start by opening Windows Explorer. In the address bar, enter %userprofile%\Links or C:\Users\[username]\Links and then press enter. This opens the Links window and you will see the basic shortcuts that are set there by default. Now the limitation has been removed for the specific user. You can drag and drop a program shortcut from the Start menu, Desktop, or any other location where you may have shortcuts stored. The PC used in this example has a desktop file with dozens of shortcuts in it so that the desktop will remain uncluttered. 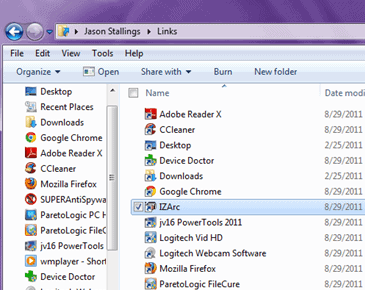 By moving some of the more frequently used shortcuts to the Link folder in Windows Explorer, access is simple. Notice that all of the added links are now listed in the Favorites list in the left pane of the Windows Explorer window. Single-click the link to open any of these programs and they will open immediately. If you want to change the order in which they are listed in the Favorites list, drag and drop from the left pane, not the right pane, to any position in the list. As you drag you will see a black line that reads “move here” when you have reached the desired location in the list. To remove links, highlight the link and press delete. This will remove the link from the Links folder, but not from the original link location (Desktop, folder, etc…). You may sort the list of shortcuts alphabetically by name if you want to. Right-click Favorites in the left pane and select “Sort by name” from the menu and this will arrange the list of links alphabetically. If you do not have many shortcuts that you use on your computer, this is not necessary at all. This is mainly for users who have many, many different programs that are utilized frequently. 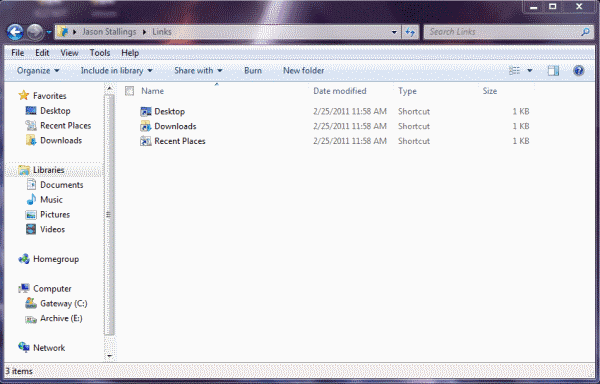 Adding these shortcuts to the Links library in Windows Explorer makes this multiple application use easier. Remember, you can also add shortcuts from the Start menu. Task Manager, Command Prompt, Snipping Tool and Sticky Notes were added from the Start menu with the same drag and drop method. This is terribly easy to do, so if you want to do it, it takes no time at all and can ease application access considerably.